Assemblyman Jordan Cunningham, R-San Luis Obispo, wants state regulators to crackdown on identity thieves who use stolen information to register as Uber and Lyft drivers. Those stolen IDs allow criminals and unlicensed drivers to circumvent background checks and vehicle inspections. In September, the NBC Bay Area Investigative Unit first exposed the underground black market for counterfeit rideshare accounts. Now law enforcement is looking into several cases of potential fraud according to an Uber spokesperson. One case under investigation involves the stolen identity of Oakland resident Jimonte Johnson. For the past four years, Johnson has worked as an Uber driver to help pay for his education. But those trips ended in February when the company blocked his account. A manager at Uber’s Greenlight Hub told Johnson that someone started a secondary account using his personal information and spent the prior two months picking up passengers under his name. “Someone had my ID. [An Uber representative] showed me. It was my ID, but they had the picture cropped out and it had someone else’s picture on there,” Johnson told NBC Bay Area. Johnson said he doesn’t understand why Uber’s technology would allow someone to start an account that’s obviously fake. Assemblyman Cunningham wants to see law enforcement work with regulators at the California Public Utilities Commission to solve cases of identity theft, especially when it leads to phony drivers getting behind the wheel. “If people are stealing IDs and fraudulently starting accounts as drivers, that’s a big problem and we may need to look at legislation to make that in and of itself a crime,” Cunningham told NBC Bay Area. In 2018, Cunningham passed legislation aimed at helping passengers confirm their rideshare driver is legitimate. The new law requires all transportation network companies to provide users with the name and photo of their driver. Cunningham introduced the bill in response to a string of alleged sexual assaults by an Uber driver in his district. “What’s troubling about these stories coming out [NBC Bay Area] is investigating, it sounds like, while we’ve made strides trying to give the customer more power in verifying their driver, they are able to evade that altogether,” Cunningham said. Johnson believes Uber should have contacted him as soon as someone tried to start an account with his driver’s license, instead of kicking him off the platform and forcing him to go to a Greenlight Hub to learn his identity was compromised. 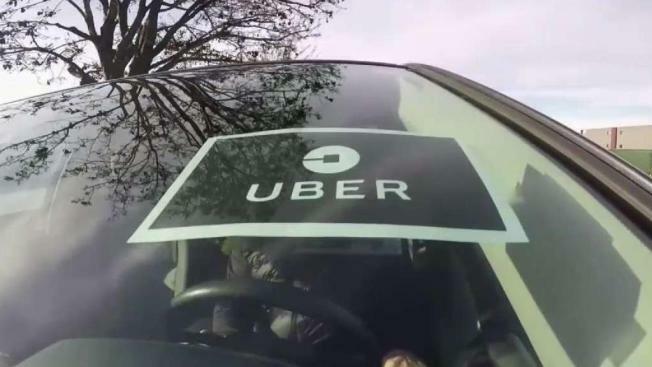 A spokesperson for Uber told NBC Bay Area the company does have a process to alert customers when the company catches suspicious behavior, but wouldn’t offer specific details. Lyft told NBC Bay Area the company also has a team that investigates fraudulent behavior. After Uber verified Johnson’s identity, his account was reactivated. While he’s relieved he can drive again, Johnson said he’s disappointed in his longtime employer. “I’m clearly not the only person this is happening to, so I feel like there should be this pressure of, ‘Hey you guys should be keeping people’s data secure and people’s identities secure.’ There should be more responsibility on Uber for this,” Johnson said. In addition to federal law enforcement, the CPUC tells NBC Bay Area the agency is now investigating cases of fake driver accounts set up with stolen information, however it’s unclear whether the agency can assess any penalty for fraudulent drivers. If you have a tip for the Investigative Unit, email theunit@nbcbayarea.com or call 888-996-TIPS.